Teledyne LeCroy's legendary Voyager USB 3.0 analyzer platform provides the industry's most accurate and reliable capture of USB 2.0 and 3.0 protocol for fast debug, analysis and problem solving. This multifunction validation platform is available with an integrated exerciser capable of both 2.0 and 3.0 host and device emulation. In addition to compliance verification and error injection, the exerciser can emulate a USB endpoint and intelligently respond to enumeration requests. Now upgraded with SuperSpeed 3.0 as well as Gigabit Ethernet data upload ports, the Voyager system features countless innovations in data analysis to help reduce time-to-market for USB systems and software. From fault recovery to performance optimization, the Voyager system helps assure that USB devices deliver excellent compatibility and throughput. The Voyager M3x analyzer front-end incorporates the latest Teledyne LeCroy probing technology to provide fast-locking and uncompromised accuracy for USB 3.0 recording. SuperSpeed USB devices utilize hardware based power management with devices frequently entering power suspend mode. While in-line, the Voyager system will detect and seamlessly recover from electrical idle while accurately showing all bus and power state transitions time-stamped within the display. The front end of the Voyager analyzer features standard USB 3.0 connectors that support USB 2.0 and 3.0 signals to provide loss-less capture of traffic from both links simultaneously. Concurrent high-speed and SuperSpeed recording allows end-to-end viewing of data transfers across a USB 3.0 hub. The system can operate as a USB 2.0/3.0 analyzer; and is also available in a 2.0-only configuration that is upgradeable to 3.0. The Voyager M3x platform includes 4GB of recording memory plus USB 3.0 and Gbe links for uploading recorded traffic to the host PC. In spooled recording mode, the Voyager provides continuous, real-time display of captured traffic allowing fast access and extended recording sessions. The heart of the Voyager analyzer is Teledyne LeCroy's revolutionary BusEngine™ technology. This state-of-the-art protocol processing core incorporates a real-time recording engine and configurable tools to selectively monitor and record SuperSpeed USB traffic. Field upgradeable firmware allows the BusEngine to evolve and support new features or future changes to the USB specification. The Voyager utilizes the legendary CATC Trace - the industry's de facto standard for USB 2.0 protocol analysis. 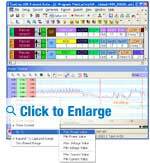 The trace viewer software uses colors and patterns to train the eye to understand information faster. When recording mixed traffic upstream from a SuperSpeed hub, Legacy 2.0 and 3.0 packets are labeled and interleaved in a single display. Each event is shown on a separate row with every field labeled and color coded.. Traffic from the logical 2.0 & 3.0 channels can be individually filtered, searched or exported from the trace. 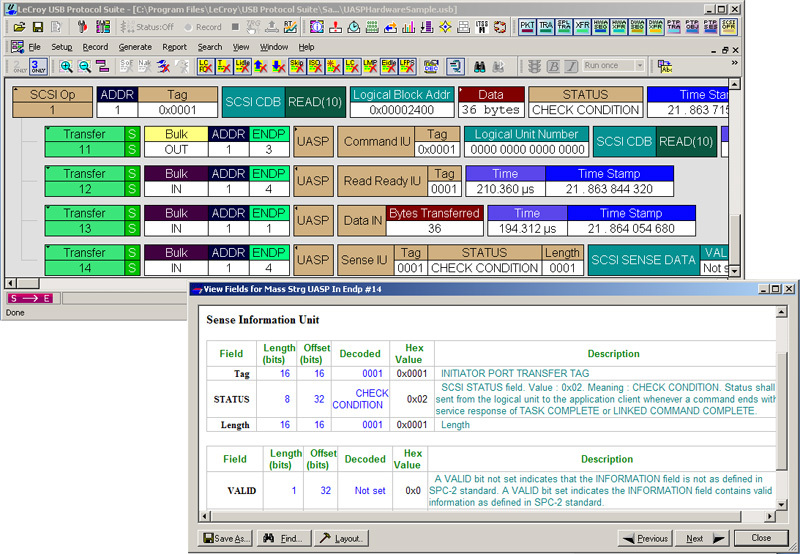 The USB Transfer level can be expanded and collapsed to show the packet layer including all link management packets (LMPs) and flow control symbols. The Voyager is the only analyzer on the market that captures every transition on the 5Gbps USB link including idles, inter-packet symbols and corrupt 10-bit symbols. 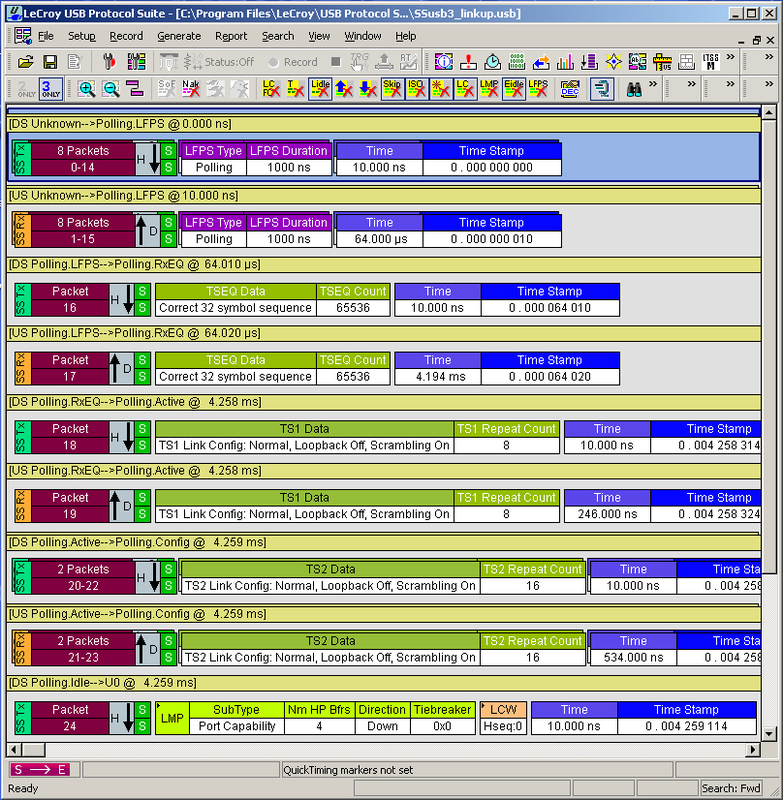 The Link Tracker provides a chronological upstream / downstream display of all ordered sets with timing resolution of 2ns. 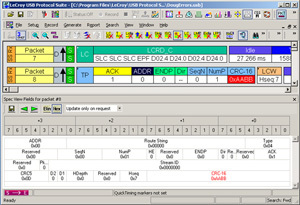 Designed to assist with low-level debugging, all symbols including training sequences can be displayed in raw 10-bit, 8-bit, scrambled, and unscrambled Hex format. Symbol-to-symbol timing measurements are possible with a single click. The Voyager provides hardware triggering to pinpoint protocol events of interest. Trigger events can be specified at the lowest levels including bus states and ordered sets (Link up, SKP, etc...) or header fields including route strings or packet types (ACK, Data, etc...). 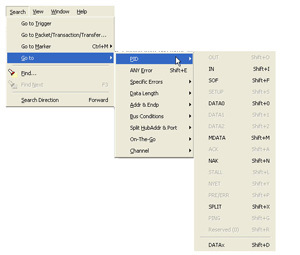 Voyager's graphical drag-and-drop interface makes setup easy. 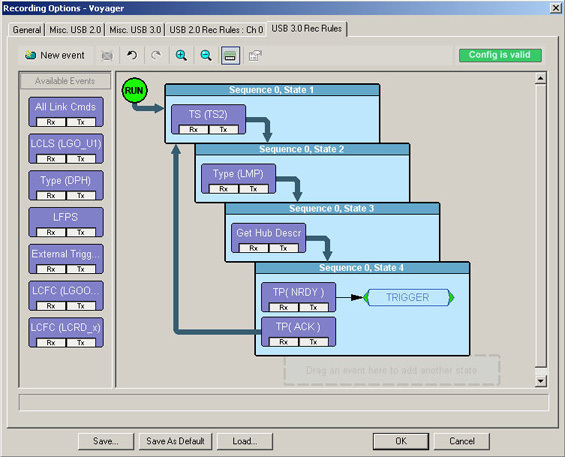 Users can define trigger logic that monitors multiple sequential event trigger scenarios that include SCSI operations, counters, loops and timers all within a multi-level sequence. SuperSpeed data transfers at 5 Gb/s can fill memory buffers in an instant making event filtering critical for efficient debug. The Voyager analyzer can filter unwanted traffic from the buffer in real-time by discarding redundant patterns such as SKPs, idles, and training sequences. 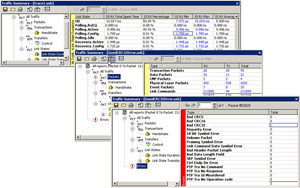 Filtering logic can also include transaction layer packets with added criteria like direction or port number. 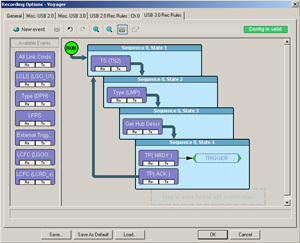 The Teledyne LeCroy Voyager can detect and flag real protocol errors including logical link and timing errors. At the lower layers, training sequences and link commands are automatically verified for proper formatting. The Spec View displays header fields in hex or binary and also marks errors in red. 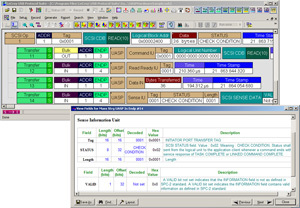 The Voyager software performs full decoding of USB device class traffic with both automatic and manual assignment of decodes to individual endpoints. The Voyager offers full support for Bulk Only Transport and USB Attached SCSI operations including command queuing. From OTG, to CCD, to Video class, Voyager provides the most comprehensive decoding available. It also supports vendor specific decoding for developers interested in automatically showing proprietary commands in the trace view. 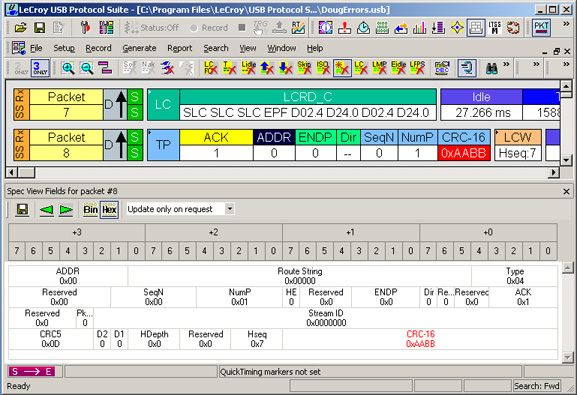 The Voyager software provides many mechanisms to measure and report on USB 2.0 and 3.0 protocol. With the Traffic Summary display, users can evaluate statistical reports at a glance or navigate to individual events. Users may select transaction packets to view ACK/NAK or Device Notification events, then jump to each occurrence with a single keystroke. Reports are available showing link throughput and flow control metrics. Higher level events are also tracked and reported at the logical USB Transfer level. The error report shows a range of protocol violations - from invalid CRCs to framing errors. 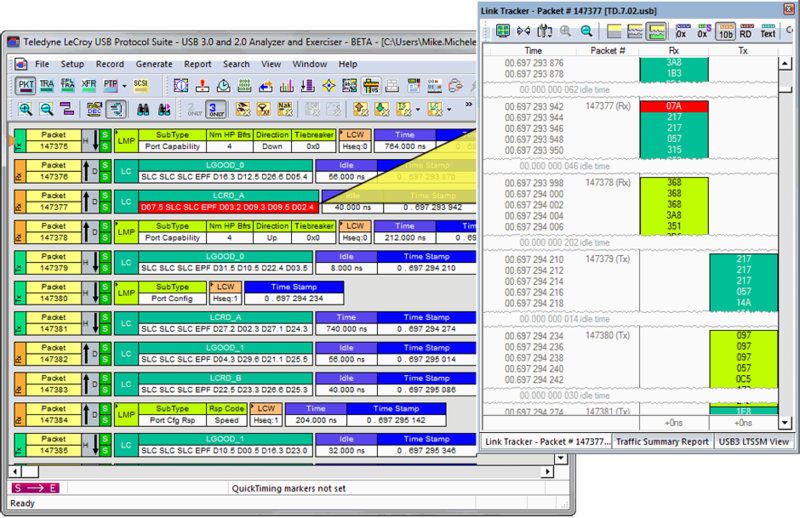 The LTSSM View provides an interactive USB 3.0 state machine diagram. Each state change is shown graphically and is hyperlinked to the trace display. 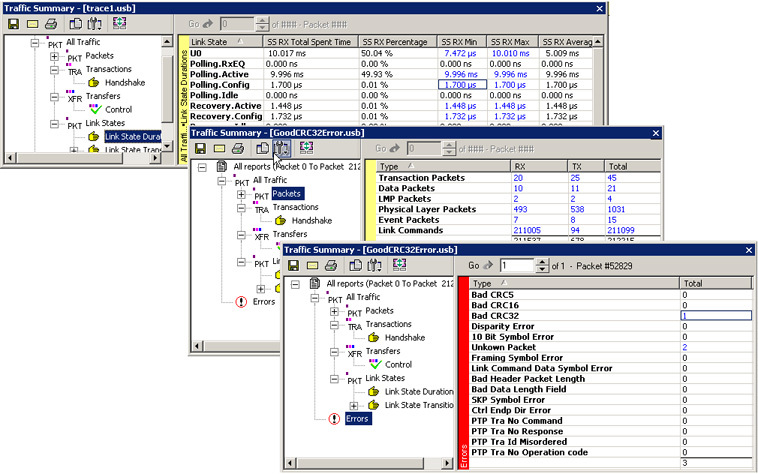 The link state timing view shows the same information in a time-line format. Bus Utilization graphs show data and packet length, bus usage by device in a histogram format. The Bandwidth calculator automatically calculates the time delta between two points in the trace. Fast Search and Find options allow users to navigate to specific packets, errors and any data type within a trace file. The CATC Trace supports filter and hide commands, to temporarily remove irrelevant data from the display for more efficient viewing. Since 1996, Teledyne LeCroy has been a key provider of tools for the USB ecosystem. The Voyager system leverages countless hours of research in high-speed serial data analysis to create the most reliable and accurate USB 3.0 analyzer system available. 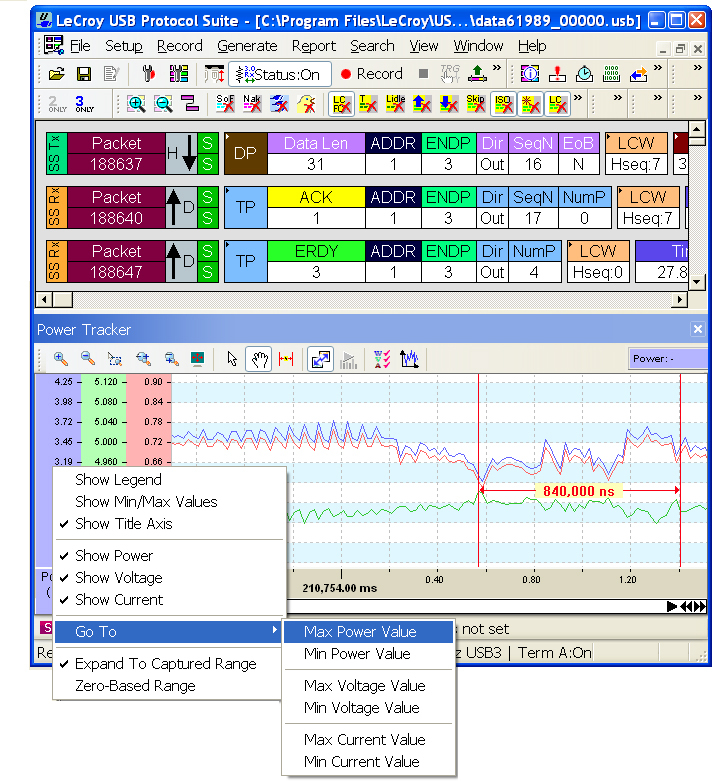 Combined with the exerciser option and the CATC Trace expert software, the Voyager platform alleviates developers from tedious byte-level analysis and lets them focus on quick resolution of protocol layer problems.